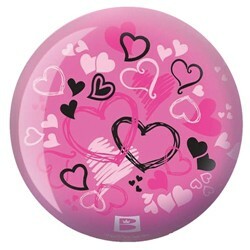 The Hearts Glow Viz-A-Ball Pink is a ball you can Bowl your heart out with! 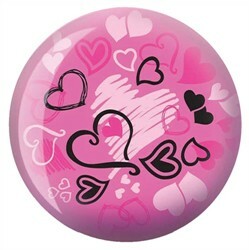 Whether displayed at home, by a blacklight, or on the lanes at the alley, let your heart glow with this ball! Great thanks for the fast shipping and communication. How long before a 15 pound becomes available? Hello! This is a special order item that is made when you order it. Once it is on back order it will be about 3 weeks to come in. Please explain why there's a choice for drilling protection and a separate choice for drilling with free protection? Why two options if one is free. Also what does the double warranty mean? The option for 'drilling w/FREE protection' is for Bowling.com to drill the ball for you and we will include the drilling protection. The drilling protection alone is if you purchase the ball through us without getting it drilled by us, and you taking the ball to a local pro shop. In that case, if anything were to happen to the ball during drilling, we will cover it for you and send you another one. Just as if we were to do the drilling for you, and if anything were to happen to the ball, we would cover it for you and drill another one for you to ship out. Does this ball come with whole drilled in?? We have weights ranging from 6 to 14lbs in stock at this time. Is ball good for arthritic fingers? You may be able to get a lower weight on this ball and also let your driller know so you can make sure the ball is easier on your fingers. If you click on the question mark next to the tab that says "drilling w/FREE protection" there will be a size chart that you can choose from to select the drilling size for the holes. Due to the time it takes to produce the Brunswick Hearts Glow Pink Viz-a-Ball ball it will ship in immediately. We cannot ship this ball outside the United States.